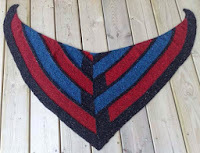 The Color Craving Shawl knitalong has been quite a journey, one that has now come to an end. First, there was the excitement of joining a knitalong, wondering what each clue would reveal. There was the anticipation of waiting for the week's clue to be released each Friday to see what would happen next. The shawl design was by Stephen West, so I was confident that I'd like this new one. I've admired many of his past shawl designs and had recently made Earth & Sky in Colorado Avalanche hockey team colors. I had thought of a number of color combinations, but then decided to go a bit wild, have fun with this, and make the shawl in Mardi Gras colors: green, purple and yellow. I found the purple and yellow quickly but just could not find the right green. 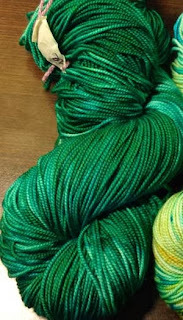 Finally, I took a dye class at Fancy Tiger in Denver and one of the skeins I did was in the emerald green that I was looking for. Right from the beginning, at the first clue, I was beginning to have my doubts. This was the strangest bit of knitting I'd ever done and I didn't care for the holes. Since this was a mystery, I was hopeful that future clues would show the shawl to be pretty, even with the holes. At the point when clues 2 and 3 were published I was still stalled, looking for my green yarn. I took a look at the spoiler pictures on the Ravelry group and was quite sure that this was not going to be the project for me. Finally, the last clue was released and knitters were uploading pictures of their finished shawls. I didn't like it. Then and there I decided that I would frog the shawl, happy that I'd gone no further than clue 1, and use the yarn for something else in the future. 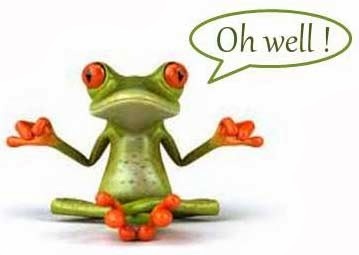 For non-knitters: frog = when you take apart a project you are ripping out the yarn, "ripit, ripit". I'm not upset as this is the chance you take when you sign up for a mystery knitalong. However, the idea of making a Mardi Gras-inspired shawl is sticking with me and I may do that one day in the future using a different pattern. Just checked Ravelry...quitting was a good choice. I'm glad you will use the yarn in a much better way. I loved the first KAL shawl, stopped in the middle of the 2nd because I didn't like the Rockefeller 'wings' at all, and didn't even attempt the third. I wish I had been wrong, but I'm so glad I didn't do it.